The history behind a single object can often tell many stories. In 2004 the museum acquired a stock certificate from an early Internet start-up. At first glance, you can probably imagine the types of stories we might tell with this object. However, when context places it in the World Trade Center on September 11, 2001, this stock certificate's history becomes much more complex. Donated by Hoover, Inc., to the museum's Division of Work and Industry, the stock certificate is a reminder that the World Trade Center was a target, symbolically representing America's economic might and reach. 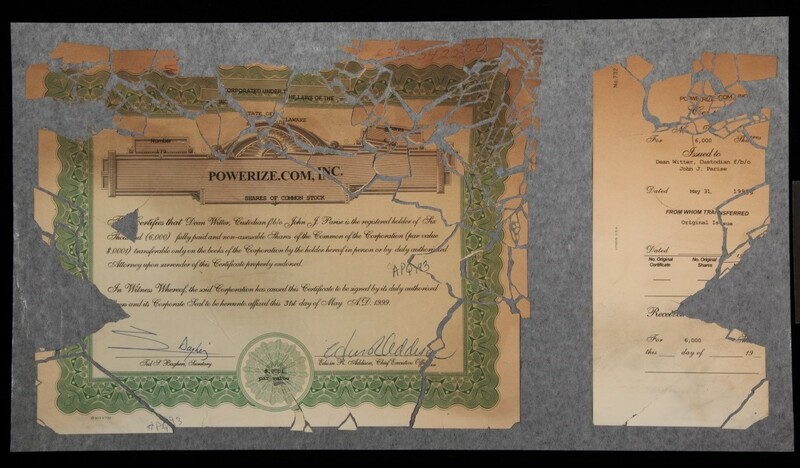 The stock certificate is also a piece of reality, as fragments of paper rained down all across the city of New York following the collapse of the World Trade Towers. Congress designated the museum as the official repository of the story of September 11, and the museum continues to collect artifacts that reflect what happened that day and the aftermath. How do you preserve the history of an object—especially a tragic history—and how does that history inform the conservation treatment the object receives in preparing it for potential display? While the answers very much depend on the object in question, making this particular stock certificate's tumultuous history immediately obvious to the viewer is especially important. 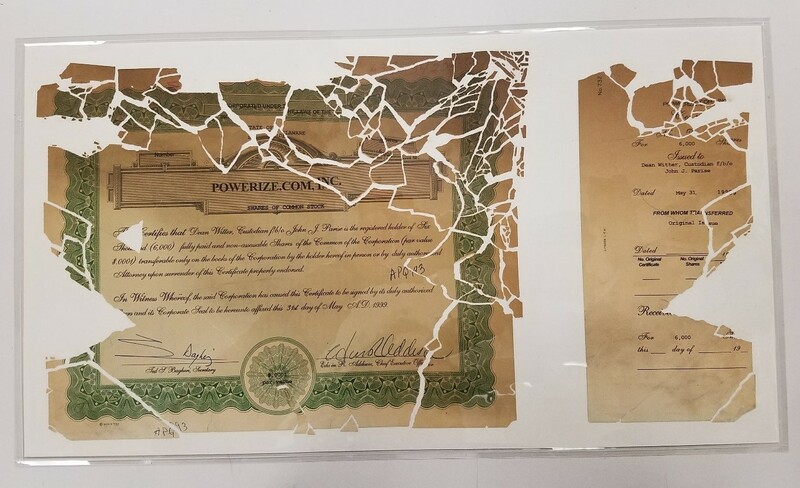 The certificate arrived in the Paper Conservation Lab as a pile of paper bits stored in the envelope and inert plastic sleeve shown below. 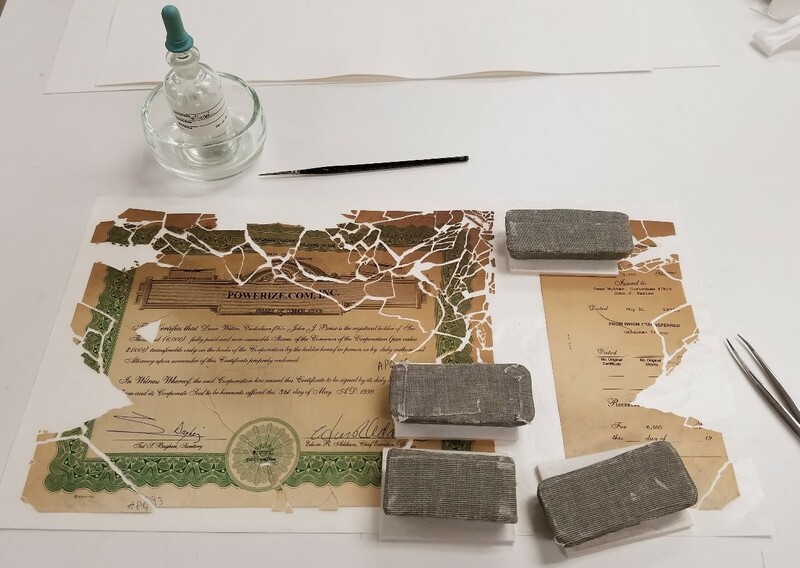 Organization of these fragments was needed to make some order out of the chaos, to make the story of the certificate clear, and to provide a safer permanent storage solution. 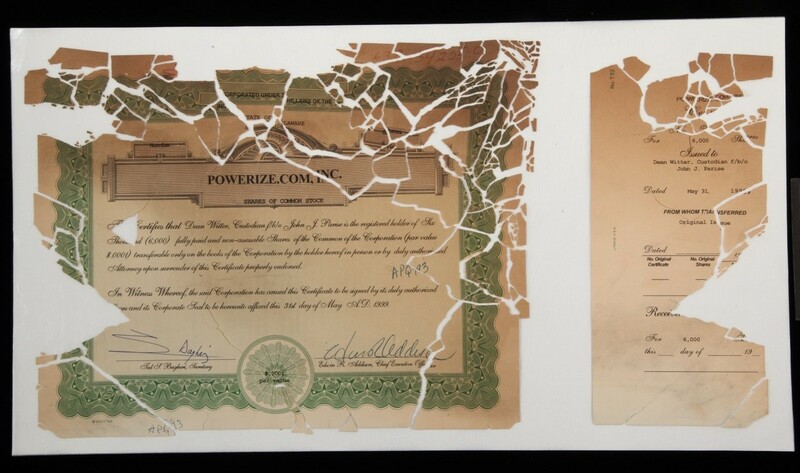 To achieve these objectives, the fragments were categorized by charred paper color, ink lines, and shape to make the original size of certificate clear. Once staff members knew how to put it together, the intentional decision was made to place the pieces slightly apart—not fitting together quite perfectly—thus maintaining their history in demonstrating the destruction the attacks caused. This was accomplished by using something called solvent-set tissue paper. The tissue is coated with an adhesive that is not tacky at room temperature, but can be activated with ethanol. This allowed for the pieces to be placed in desired positions, secured with ethanol applied with a miniature paint brush, and then weighted down while the softened adhesive set to establish a strong connection. This process made organization and workability easier, as secured fragments wouldn't move around while adjusting others. The fragments can be seen on the tissue in the photos below. Next, MicroChamber paper, an alkaline paper infused with zeolites, was placed behind the solvent-set tissue. Zeolites are compounds that act as molecular sieves, removing and neutralizing acids, pollutants, and volatiles (compounds that can vaporize easily). Even this many years after the attacks of September 11, 2001, vapors from smoke damage may still come off the certificate, which can be harmful to the object. These layers of paper were then encapsulated with the inert plastic Mylar, sealed to itself at the edges. Encapsulation secures all the pieces together and will keep the document safe while it is in storage, ensuring dust and water cannot reach it. Due to paper's sensitivity to light, this document will likely spend a lot of time off display but, even in storage where light exposure is low, protection and stabilization are important. This entire treatment is readily reversible, meaning future generations of conservators could safely get it back to its original condition if the need arose. The intent of conservation is not to make an object appear new again but to care for the object while upholding its history—which, in this case, includes the visible damage to the object. It can be easy for conservation work to become a standardized routine of cleaning and repairing to stabilize an object. But it is important to remember to step back and think about an object's specific story and setting in order to develop an appropriate and safe conservation, storage, and display plan that will allow a sometimes tragic story and damage to be preserved. Devin Mattlin completed a summer 2017 internship in the Paper Conservation Lab. For more behind-the-scenes stories like this one, sign up for our monthly newsletter. Why did the Smithsonian collect a handwritten note from September 11, 2001?